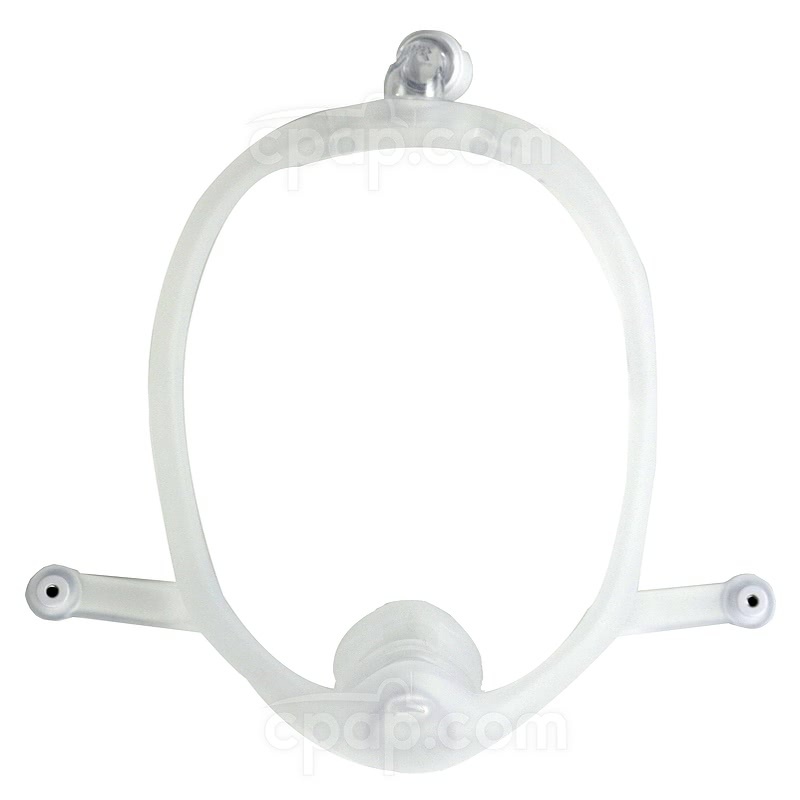 The DreamWisp Nasal CPAP Mask Without Headgear features the DreamWisp Nasal CPAP Mask and a cushion in a selected size but does not contain the headgear. It's a convenient way to freshen up your existing equipment without needing to purchase a new mask. 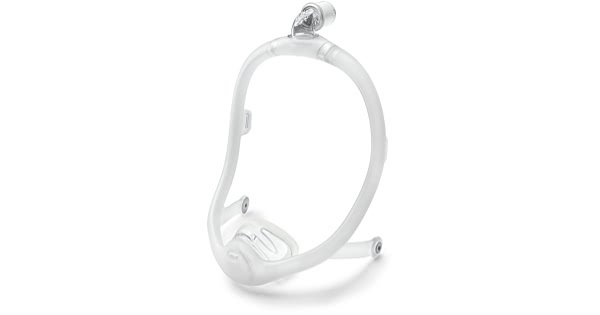 The DreamWisp Nasal CPAP Mask Without Headgear uses an over-the-nose nasal cushion designed to minimize bulk, and allows someone to sleep in almost any position they find comfortable. The DreamWisp Nasal CPAP Mask Without Headgear comes with a cushion in a selected size. This is helpful if you know the cushion size that will work the best, and don't need to get a kit with multiple cushion sizes. Simply select the size you need, and you're on your way to freshening up your mask. 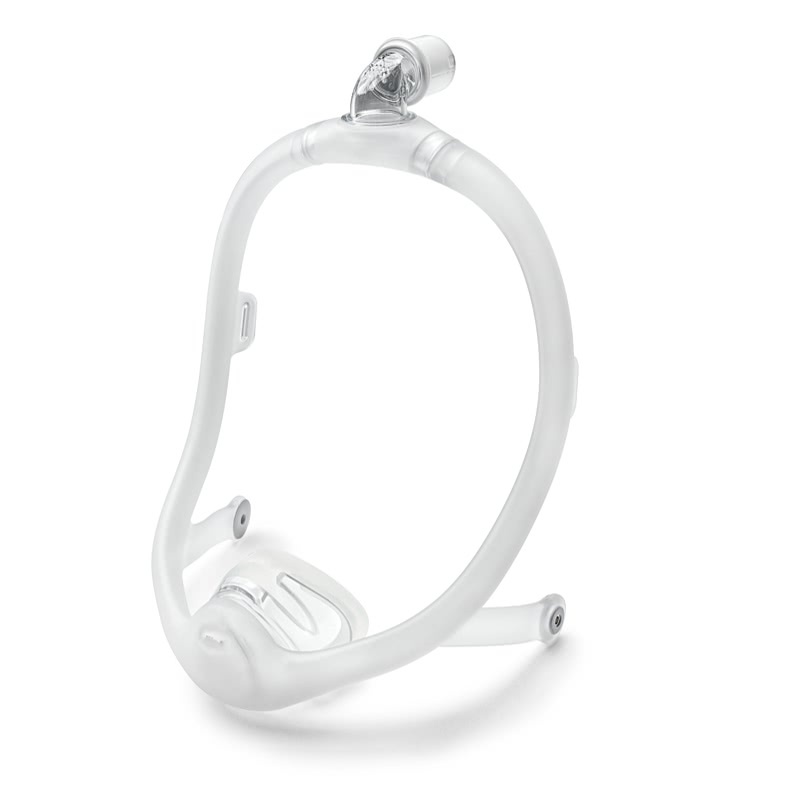 The DreamWisp Nasal CPAP Mask Without Headgear uses a top-of-the-head hose connection with a 360-degree swivel. This is great for active sleepers who move around a lot during sleep. The placement of the hose connection eliminates a lot of the bulk traditionally found in the front of a mask, allowing for a wider field of vision than most traditional masks. The cushion itself is designed to have a smaller footprint than other over-the-nose cushions. This means you can see— and do— more before falling asleep. Read a book, watch a movie, or send a text; you have many options when it comes to the view you get from the DreamWisp. By having the airflow through the mask frame on its way to the cushion, the hollow frame reduces the number of parts and eliminates the need to have a vision-blocking tube to carry the air. The mask frame is also designed to automatically redirect the airflow in the event a new sleeping position cuts off airflow on one side. By having more than one exhalation port, escaping air has two options to exit the mask, instead of just one. This reduces the pressure of the air as it leaves the mask and lowers the amount of noise coming from the mask itself. This helps create a better night's sleep, for both you and your bed partner. The Philips Respironics DreamWisp can be cleaned once a week in the dishwasher. Be careful not to wash the headgear or any soft wraps in the dishwasher as this could damage or destroy these items. Avoid cleaning in the dishwasher more frequently than once a week, as this can reduce the lifespan of the mask. Disposal: Discard this mask once each year, and follow local regulations. Unclasp the magnetic headgear clips from the frame. Position the cushion over the nose, and attach the headgear clips. Tighten the headgear for a firm but comfortable fit. It's normal for a little air to leak out of the DreamWisp, but you should not feel the air blow up your cheeks or into your eyes. Usually, you can fix this by tightening the headgear straps, but be careful not to overtighten. The fit should be firm but comfortable. The DreamWisp frame and cushion is designed to be cleaned in a dishwasher once each week, allowing for deeper cleaning than can be done by regular hand washing. You should only clean in the dishwasher once per week, to preserve the lifespan of the mask. Daily washing by hand is still the ideal way to clean the mask. In order to clean the mask, it should be completely disassembled. Remove the headgear, and separate the cushion from the frame. You'll also need to unhook the elbow from the frame connector. Here are the steps to clean the individual parts of the mask. To clean the elbow and frame by hand, you'll need to do so with warm water and mild, fragrance-free soap, and submerge the frame and elbow in the water. Allow the water to penetrate the inside of the frame. Gently scrub the elbow and the frame exterior with a cloth. Rinse the mask components thoroughly to remove all soap. Set aside to air dry. Make sure the mask is completely dry before next use. The cushion can be cleaned by cleaning with Mask Wipes or can be cleaned with mild soap and water. Make sure to scrub thoroughly, removing any deposits that have collected in the crevices of the cushion. Rinse well and allow to air dry. Make sure mask is completely dry before next use. Consult your doctor and discontinue use immediately if you experience any of the following: unusual chest discomfort, shortness of breath, severe headache, eye pain or eye infections. This device contains magnets. Some implanted medical devices are extremely sensitive to magnets and should remain at least 2 inches away from these devices. This includes pacemakers and defibrillators. Do not use while undergoing an MRI or other magnetic resonance imaging technology, including CT scans.